Posted March 24, 2011 by William Martin & filed under Headlines. 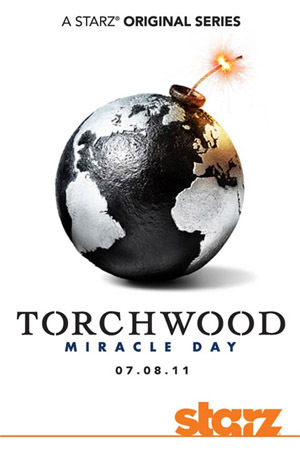 US TV channel Starz have issued a brand new promotional poster for Torchwood: Miracle Day and announced that the series will launch on Friday 8th July. Writer Jane Espenson revealed earlier this month that scripts for the ten-part series are almost complete. The UK launch date has not yet been confirmed, but it has previously been strongly hinted that the series will air simultaneously in the UK and America. “One day, nobody dies. All across the world, nobody dies. And then the next day, and the next, and the next, people keep aging – they get hurt and sick – but they never die. The result: a population boom, overnight. “With all the extra people, resources are finite. It’s said that in four month’s time, the human race will cease to be viable. But this can’t be a natural event – someone’s got to be behind it. It’s a race against time as C.I.A. agent Rex Matheson investigates a global conspiracy.